The fantasy version of Total War: Attila. The analogy isn’t perfect – the Warhammer factions start off small, whereas Attila offered large, pre-existing Roman and Sassanid empires. 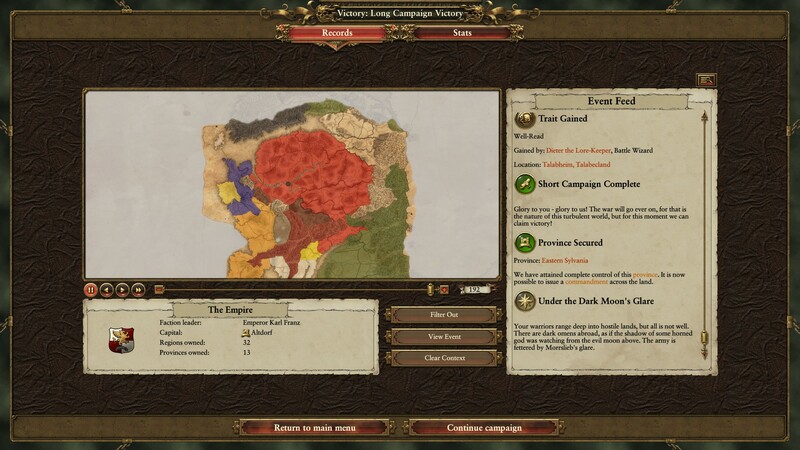 Nonetheless, both games share the same challenge (hold off the hordes — Huns in Attila, Chaos in Warhammer), and Warhammer’s basic gameplay mechanics, from the province system to razing and rebuilding settlements, will be familiar to Attila veterans. This is part of the appeal: Attila is one of the most interesting games in the genre, and I don’t mind seeing another Total War game following its footsteps. Relatively manageable. In terms of complexity, this feels somewhere between the big, elaborate Attila and the more elegant Age of Charlemagne expansion. While there is a fairly large roster of units, city management is simpler than the preceding games, with two key numbers per province (public order and income) – no more food or sanitation. The victory conditions are also fairly reasonable — I had 32 settlements upon victory, versus 55 when I won Attila and 54 when I won Age of Charlemagne. Finally, the campaign isn’t too long – I won in around 30 hours, which includes one restart, a lot of reloads, and a buildup that turned out to be unnecessary for the final campaign against the vampires. Strong mid-to-late game. The Chaos invasion, involving waves of free-spawning AI troops, neatly solves the “easy late game” problem endemic to strategy. This solution (seen earlier with Attila’s Huns) seems to be catching on with developers – see the late-game crises in Stellaris. … anticlimactic endgame. After I defeated Chaos, fighting the orcs and mopping up the vampires provided a relatively easy epilogue. 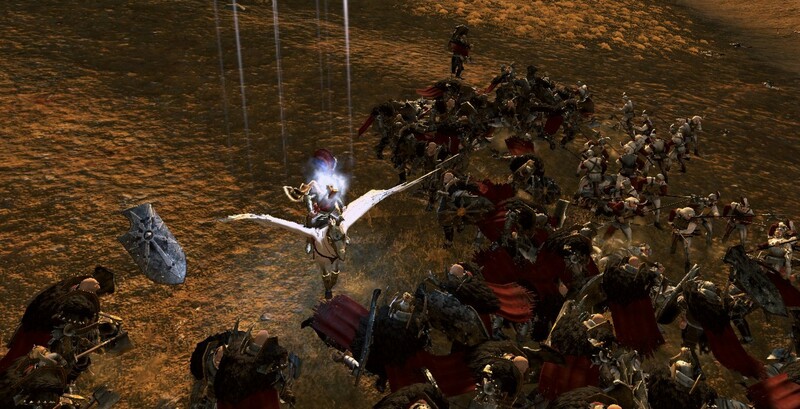 Perhaps the Chaos invasion, which begins relatively early, could have been pushed back to later in the game. Clever little touches. For instance, when the main Chaos invasion began, the game gave me a significant bonus to diplomacy with other humans and dwarfs, allowing me to assemble my grand alliance – a cool integration between theme and mechanics2. The Total War battle system remains strong. Key factors are still present, such as terrain, positioning, and morale. Playing the Empire, which has access to combined arms3, I found different tactics worked better against different foes. Against Chaos, I loved fielding Imperial gunpowder cavalry; the horsemen could pepper lumbering Chaos beasts with bullets, then ride away, laughing. Against the orcs, who used their own missile cavalry to harass my knights, suddenly I wished I had more foot archers. … and it still looks cool. The Emperor duelling the Vampire leader, or swooping down on pegasus-back to chase down the fleeing Chaos leader. Zombies melting away as regiments of Imperial heavy infantry, clad in full plate and wielding zweihanders, press home their charge. 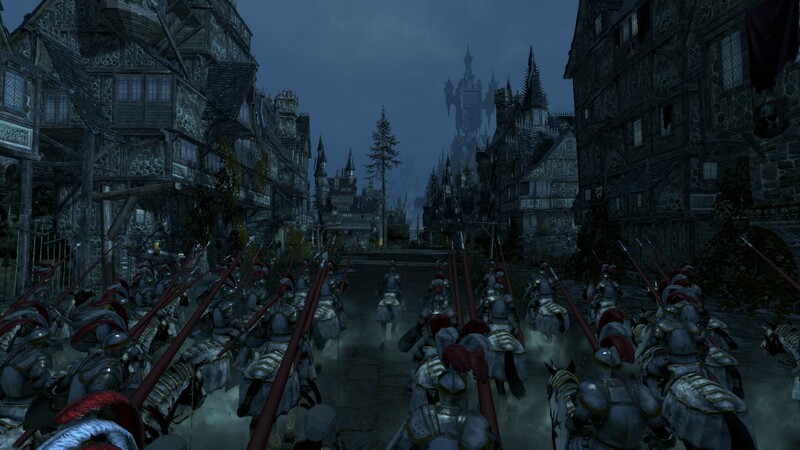 Knights trotting through Vampire-held cities. As with its Total War peers, Warhammer delivers spectacle. * Enemy armies merrily scampering just outside the player’s movement range. Solution: install this mod, which gives a 10% bonus to movement in friendly country. * Enemy agent spam. Regular readers will know my loathing for agents and espionage in strategy games, which are usually fiddly and dice-based. Solution: install a mod that cracks down on agents’ active abilities. Previous Previous post: Do you like written LPs and AARs?